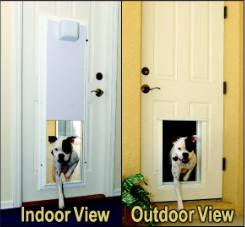 PlexiDor electronic dog / cat door provides security with pet access control for doors & walls! The PlexiDor electronic dog door is one of the most sophisticated dog doors on the market today, only opening for your pets while keeping other animals out. The key to the technology is an electronic RFID (radio frequency identification) "key" that is attached to your pet's collar. The door reads the key code as your dog approaches and if it recognizes the code, it slides up like a mini garage door, allowing access for your pet. You can program the key to accept just one of thousands of possible key codes, so it is very secure! The rugged electronic key tags do not require batteries, are water and shock proof, and also work with many underground electronic fencing systems. We have models for both door mounting and wall mounting to suit dogs up to roughly 125 lbs in size. Both models are available in 2 colors: white, and brown. All models come complete with pet door, exterior trim, stainless steel hardware, 2 collar keys, power supply and 15ft cord, and are backed by PlexiDor's industry leading 90-day satisfaction guarantee and 5-year no-hassle warranty! Secure - Interior stainless steel locking bar, thousands of key codes. Opens only for your pets. Tough shatter resistant panel. Heavy, thick aluminum frames that won't bend. Won't interfere with home security system. Energy Efficient - No gaps for air filtration, saves you money. Pet / Child Safe - Panel won't close when obstructed. Total control up and down. No pinched tails. No pinched fingers. Panel will not free-fall in the event of a power failure. Dependable - Runs on household current (can be plugged in or hard wired). Collar key is waterproof and does not need batteries. Key fastens securely to collar and won't fall off. Interior mounted motor won't freeze up in cold. Easy to Use - One button programming to add or change collar codes quickly and simply. Collar key snaps on easily and stays on. Pet Size up to approx. 125 lbs.